Railroad sanding plays a vital role in the safety and efficiency of the industry today. With ridership on passenger lines steadily increasing and the energy boom adding an improving outlook for the industry, today’s demand for efficient railroad sanding has never been greater. 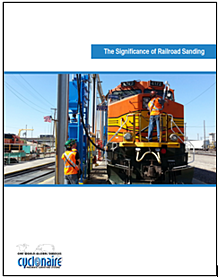 To fully understand railroad sanding and the products available to you, please complete the form to obtain your copy of our eBook today.